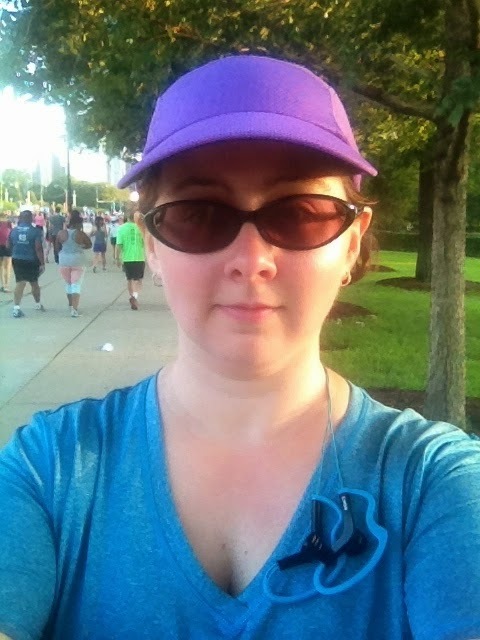 This morning I ran the 5k portion of the Magnificent Mile Chicago Women's Half Marathon and 5k. The race itself didn't start until 7am, but I wanted to get there early (I'm always terrified of being late) and don't have a car, so I woke up before the sun was out to make sure that I had all the time I needed to make it to the race. It was early, you guys. Really early. Being a Sunday, I had to contend with the limitations of the CTA (Chicago's public transportation). It usually takes me about an hour to get downtown, but I knew it would take longer this morning because of the Sunday schedule for the el. 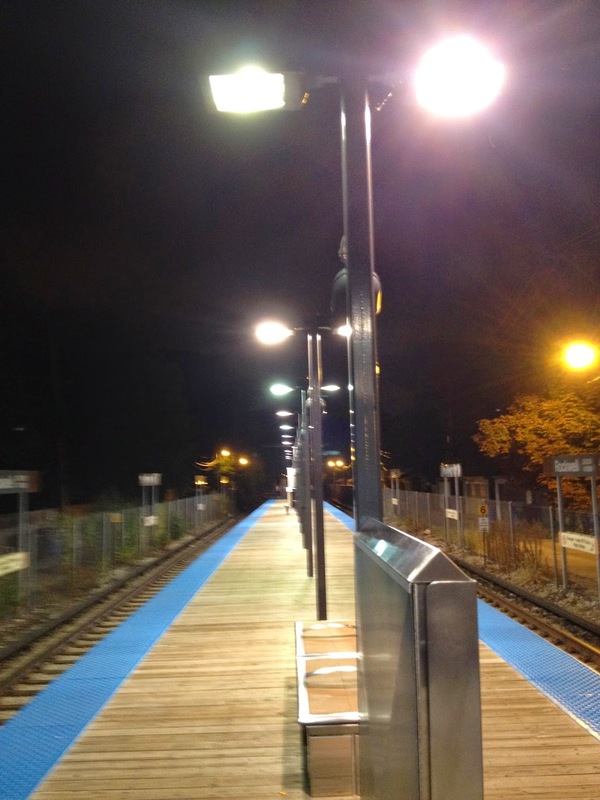 I live on the brown line, which doesn't start running until 5am on Sundays, and only runs as far as Belmont until 7am, so I would have to transfer to the red line in order to get all the way downtown. When my first alarm went off at 4am (I had two alarms set, just in case I slept through the first one), I got ready for the day ahead. I washed my face, brushed my teeth, got dressed (I made sure to have everything I needed out and ready last night), fed Hannah her cat food (she was freaked out about the change to our morning routine), and fed myself a light breakfast (a piece of toast with almond butter and half a banana). I made sure I had everything I needed, and then I was off! 5:05am saw me waiting for the train. It was surreal being out so early, in the dark, on an empty train platform. The attendant at the train station greeted me with a hearty "Good morning!" as I went through the turnstile. I don't think he is used to seeing folks out this early on the weekends. Hello, creepy and empty train platform. As my train got closer to Belmont, more and more runners joined me. By the time I transferred to the red line, the whole train car was filled with other runners. I think the few folks who weren't on their way to the race (I counted 3 people on my train car) were wondering what the hell was happening. Who are all these people? Why are they all wearing spandex? What's with the weird numbers pinned to their shirts? Everyone got off the train together and walked over to the race. It was incredibly easy to find, being right downtown in Grant Park. When in doubt about which way to go, just follow the other runners. It was strange being downtown so early, but it was also beautiful. I made a point to stop from time to time to enjoy the view before, during, and after the race. As the sun rose, I started to get ready for the race. I have to say it - I had a blast! All of my worries brought about by the changes to the half marathon course (I felt bad for the folks who were running a different race than what they signed up for), the changes to the shirt, and the disappointing market and packet pick up were quickly erased. I watched the sun rise over the lake. It almost made me want to always get up early enough to watch the sunrise. Personally, I thought everything was laid out well, with plenty of volunteers there to direct folks to where they needed to go. The volunteers were seriously awesome at this race, whether they were offering treats, water, information, or high fives. There were folks walking around before the race handing out Shot Bloks, but I didn't take any. I was only doing the 5k, so fueling for the race wasn't really a concern. Everything was clearly labeled and easy to find. Gear check was hard to miss, with different gear check lines assigned based on bib number, which made pick up after the race nice and easy. My first stop (yes, even before gear check) was at the bathrooms, which were conveniently close to the starting area. I haven't done many races, but I think one of the most important pieces of advice I've ever been given and I can ever give is to find the bathrooms right away and make a pit stop, even if you don't think you need to. 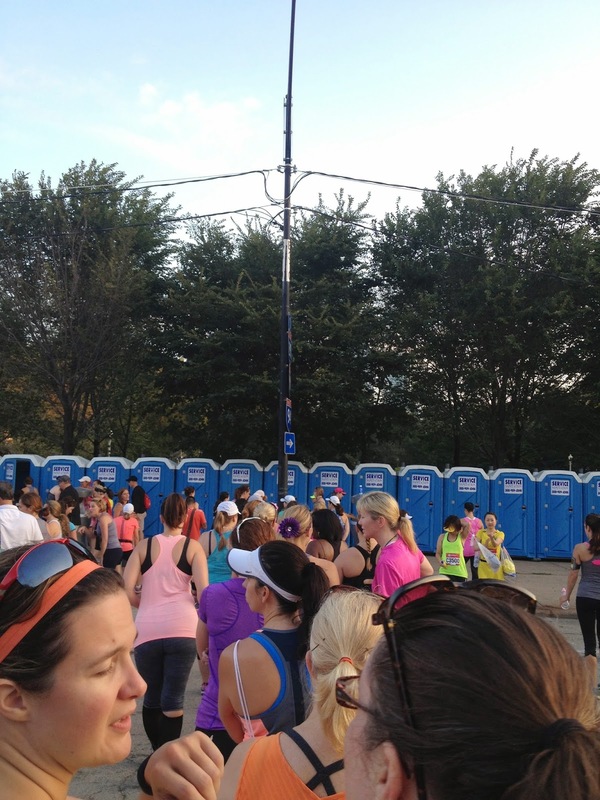 There is nothing worse than running an entire race (even a short race) while needing to pee. Waiting in the line for the bathrooms. There was the usual pre-race group warm up, then everyone made one last pit stop at the bathrooms before getting into positions (seriously, go before the race starts, folks). As all the runners finished lining up, there were the usual announcements explaining how things would work, where to turn, where the aid stations were. Then the national anthem was sung. Then we just waited for the final word that everything was good to go for the run to start. Everyone was assigned to a specific corral (A-E). As expected, I was towards the back, in corral D. They released each corral separately, which helped make sure that things didn't get too crowded and that faster folks didn't get trapped behind us slow pokes. The corrals were packed! It was one of the few negative things I noticed. There simply wasn't room in each corral for everyone, and there were some folks who were supposed to be in corral A or B stuck back in D or E because it was too packed to move forward. There were even folks lining up along side the corrals, hoping to work their way into the crowd as people moved out of corrals and over the starting line. 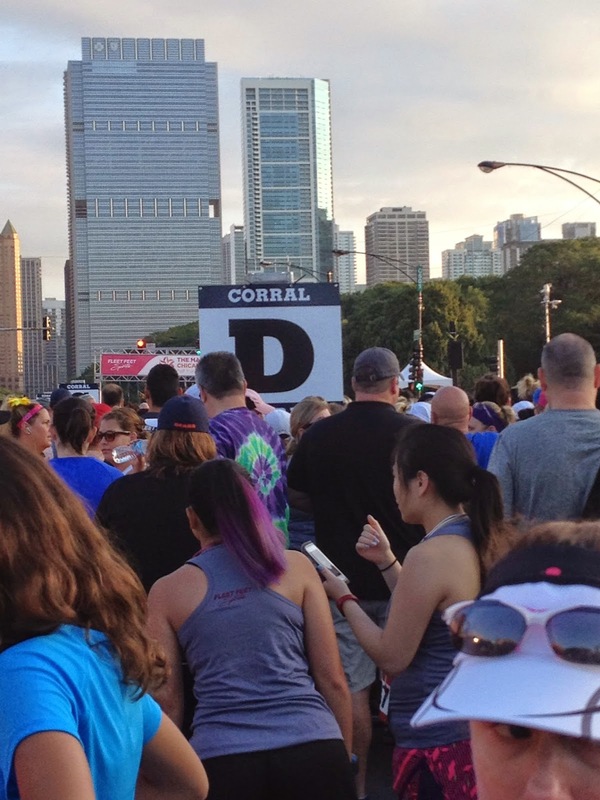 Corral D - aka my home until the starting line. The route for the 5k was fantastic! Running down Michigan Avenue was a great feeling and a wonderful experience. I usually run around my neighborhood, so being downtown, among all those giant buildings, was a little crazy. The views were outstanding, and it was an experience I won't forget. The other runners were also clearly excited. There was cheering as the fast folks came whizzing by us, heading back to the finish line. There were high fives and shouts from runners to other runners of "You got this!" and "Looking good!" and "Keep it up!" It was a really great experience. The camaraderie and support among the various runners and the volunteers was really inspiring and helped make the morning incredible. The first aid station (and only aid station for the 5k) was still well stocked when I got there. I did slow down and walk a bit while I drank some water once I hit the aid station. The day was beautiful, but it is summer, so it was hot, humid, and the sun was shining bright. There was little to no shade on the route, and by the time I hit the aid station I was already getting a little overheated and felt a headache coming on. I was struggling with the 5k, so I can't imagine what it was like for those running the half marathon. I just hope that all of their aid stations were well stocked, too. Look at all those runners! I had the joy of hearing my name called out over the loud speaker at the finish line (the first time this has happened to me in a race) and was greeted by volunteers handing out cold water, cold wash cloths, and snacks. There were apples, Luna protein bars, Gatorade, and biscotti. I grabbed one of everything, found a quiet, shady place to stretch and sit down for a minute while I cooled off. Water has never tasted so good! And I think that the ice cold wash cloth was the best thing to happen to me this year. There were also frozen chocolate covered bananas, which were kind of delightful. The only thing better than a banana after a race is a chocolate covered frozen banana. After the race, there was music and general merriment as everyone waited for the half marathon runners to start coming in. I took advantage of the tent offering stretching and injury screenings. It was a little awkward having some random guy help me get a good stretch. I'm generally not big on touching and really dislike being touched by strangers. But hot damn! My legs felt so much better afterwards! Free stretching and injury screens? Yes, please. 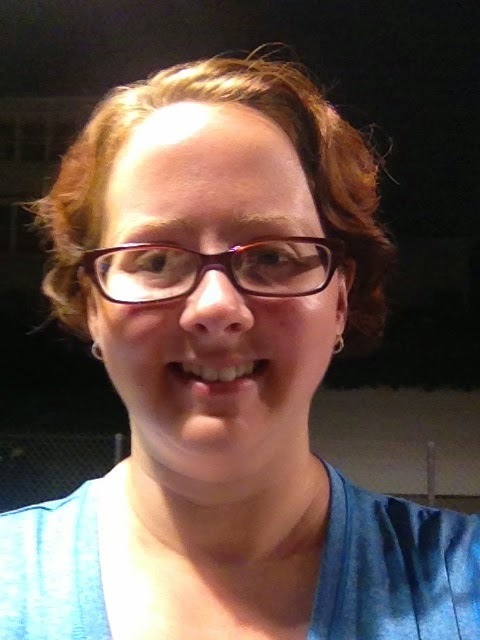 I hung out for a while, soaking in the general festive atmosphere, but eventually I was just too hot and my headache wouldn't go away, so I decided to begrudgingly abandon the festivities and headed home. I know I only ran a 5k, but I accomplished what I set out to do with this race, and, as a bonus, it is the first time in a long time that running hasn't felt incredibly painful. Thanks for the fun morning, The Magnificent Mile Chicago Women's Half Marathon and 5k! Overall, I thought it was a great race. Again, I ran the 5k, so I can't speak for the half marathon. Maybe next year I'll be able to tackle that distance.